Our office is on the corner of Route 9 and Pennsylvania Avenue. We are 5 blocks south of Marriot Seaview Country Club, on the left hand side going south. 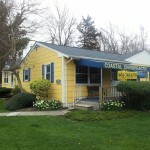 It is a free standing yellow rancher with blue awnings.